TL;DR: In this article, you will learn how to create and secure a jQuery SPA and a Spring Boot API using OAuth 2.0. You will start by scaffolding a new Spring Boot project. Then you will add some endpoints to it. After that, you will use Spring Security to secure the whole thing. Lastly, you will create a SPA (with jQuery) to consume the API. If needed, you can find the reference code developed throughout the article in this GitHub repository. "Learn how to secure Spring Boot APIs and SPAs with OAuth 2.0." JDK 8 or JDK 10 (this article was tested with JDK 10). Any Java IDE of your choice (e.g., IntelliJ, Eclipse, or Netbeans). In other words, this protocol allows a user to grant limited access to their data on one app (web app, mobile app, etc. ), to another app, without having to expose their credentials. If you don't know much about OAuth 2.0 and want to learn more, make sure you check out this resource. Since you are going to develop a demo application that is composed of a Single-Page App (SPA) that consumes resources from a Spring Boot API that is secured with OAuth 2.0, you will have to implement what is known as the OAuth 2.0 Implicit Grant. The Implicit Grant is an OAuth 2.0 flow specifically tailored for public SPAs clients that want to consume APIs. If you were developing a different kind of client (for example, a mobile app), you would have to choose another flow. To learn more about the different flows and how to implement each one, take a look at this resource. 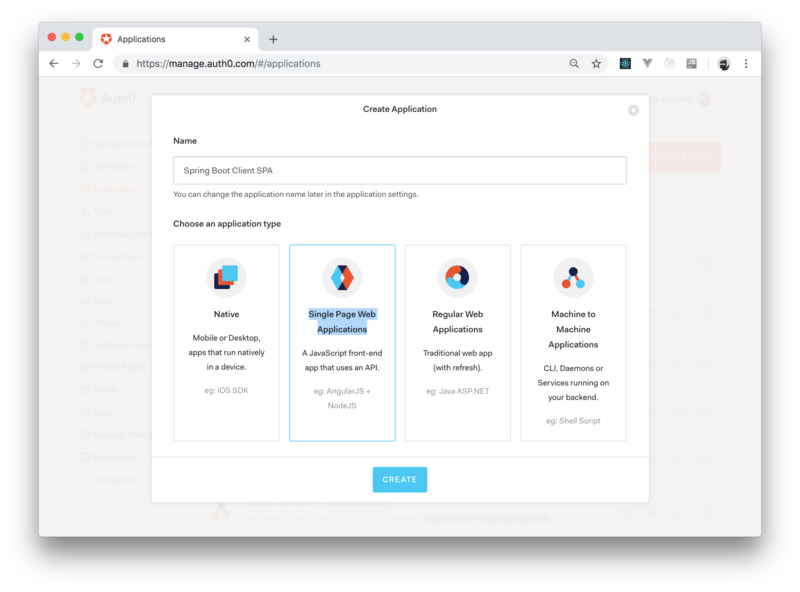 In this section, you will start from scratch, create a new Spring Boot API, secure it with OAuth 2.0, and then create a SPA to consume this API. However, before you can dive deep in the code, you will need an identity provider that implements the OAuth 2.0 protocol. For this demo application, you will use Auth0 and, for that, you'll need to sign up for a free Auth0 account here. and the signing algorithm (for this field, make sure you choose RS256). Then, you can create your Auth0 API by clicking on the Create button. After inserting the above values on the form, hit the Add button to save this new scope into your Auth0 API. With this in place, you are done with the configuration and can start working on your backend API. Then, on the Dependencies section, you will have to use the search box to include two libraries: Web and Security. After filling out the form, click on the Generate Project button to download your new application. When your browser finished downloading it, extract the contents of the downloaded file and import the project into your preferred IDE. /api/public: This endpoint will be publicly accessible and will return a simple text message. /api/private: This endpoint will only be accessible by users who have been authenticated. /api/private-scoped: This endpoint will only be accessible by users who have been authenticated and that have granted a particular scope. /config: This endpoint will be publicly accessible and will return some configuration properties that your SPA will use to authenticate users. resourceId: This will reference your Auth0 API identifier (e.g., http://localhost:8080/api). clientId: This will reference the Client ID of the Auth0 Application that you still need to create. Just make sure you replace <DOMAIN> and <AUTH0-API-IDENTIFIER> with your own Auth0 values. Don't worry about the <CLIENT-ID> placeholder now, you will replace it later. configure(HttpSecurity http), used to specify which API endpoints are secured (in this case, mvcMatchers("/api/**").authenticated()), which are secured and require a particular scope (i.e., antMatchers("/api/private-scoped").access("#oauth2.hasScope('read:messages')")), and which endpoints are public (i.e., mvcMatchers("/api/public").permitAll()). The only problem now is that the SecurityConfig class does not know how to verify your access token. That is, whenever your users send requests to your secured endpoints, they will include access tokens that are signed with a private key. In order for this class to know if it can trust or not these access tokens, Spring will need the public key that pairs with this private key used to sign the token. To get this public key, your backend API will need to issue a request to an endpoint known as the JWKS endpoint. You don't really have to understand the details about how this works but, if you are curious, you can read all about it here and on the official specification. Note: You will have to replace <DOMAIN> with your own Auth0 domain. Just like you did before while configuring the auth0.domain environment variable. enabling users to use this access tokens to issue requests to your new Spring Boot API. "Spring Boot comes with some utilities classes that facilitate securing APIs with OAuth 2.0." In this section, you are going to create a jQuery SPA that will interact with your Spring Boot API. Before starting, you will need to create an Auth0 Application to represent your SPA. To do so, head to the Applications page in your Auth0 dashboard and click on Create Application. 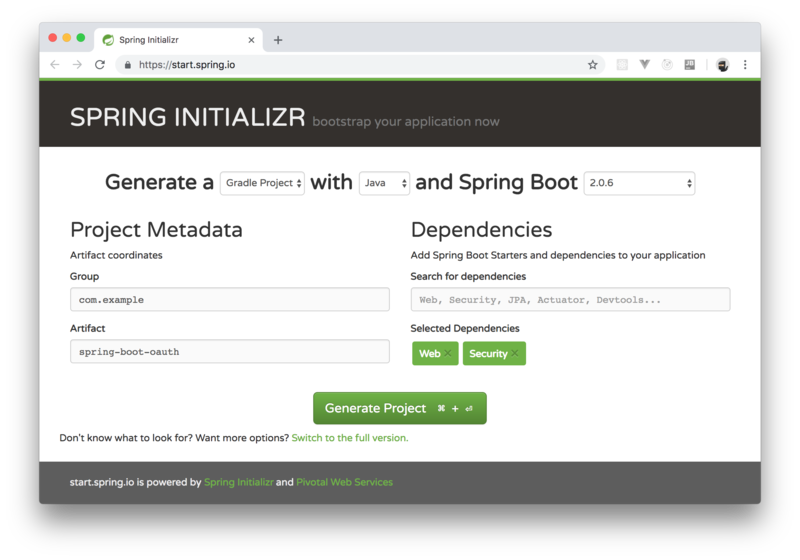 After clicking on it, Auth0 will show a dialog where you will have to input a name for your app (you can call it "Spring Boot Client SPA" or anything like that) and define the type of the application. As you are going to build an app that resembles a SPA, choose the Single Page Web Applications type. Now, clicking on the Create button will make Auth0 redirect you to the Quick Start section of your new app. From there, click on the Settings tab and add http://localhost:8080 to the Allowed Callback URLs field. As a security measure, Auth0 will only redirect users (after the authentication process) back to the URLs listed on this field (i.e., whenever you move into production, make sure you have a configuration that only lists your real internet domain). Now, click on Save Changes. With that covered, you are ready to create your SPA. For starters, create an assets directory under /src/main/resources/static. This is where you are going to put all files related to your client application. Log in to call a private (secured) server endpoint. Home (btn-home-view): This button will show the default view. Profile (btn-profile-view): This button will show a view with the profile of the logged-in user. Ping (btn-ping-view): This button will show a view where users will be able to issue different types of requests. Log In (btn-login): This button will start the authentication process. Log Out (btn-logout): This button will log out the current user. Call Public (btn-ping-public): This button will call the public endpoint (/api/public) and show the returned message. Call Private (btn-ping-private): This button will call one of the private endpoints (/api/private in this case) and show the returned message. 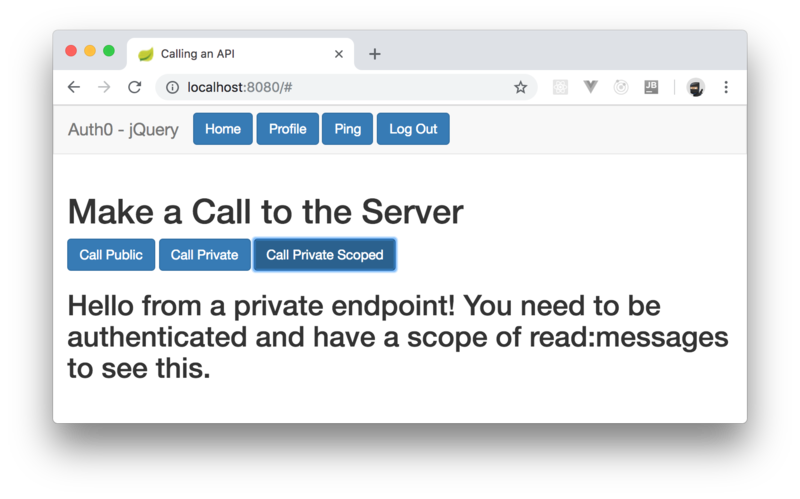 Call Private Scoped (btn-ping-private-scoped): This button will call the other private endpoint (/api/private-scoped) and show the returned message. The rest of the elements defined in this HTML file is there so you can show users' profiles, messages returned by the server, etc. and by defining and attaching event listeners to the buttons defined in your HTML file. accessToken: Your script will use this token while issuing requests to the secured endpoints in your Spring Boot API. idTokenPayload: Your client app will use this info to display information about the logged-in user. Note: If you imported your project correctly inside your IDE, you will probably be able to run through the IDE's interface. After running your app, if you head to http://localhost:8080, you will see a screen where you will be able to login. After logging in, you will be redirected back to the SPA where you will see a similar screen but with some other buttons. If you click on the Ping button, you will see a section where you will have three options. The first one will be a button to issue requests to the public endpoint. The second one will be a button to issue requests to the endpoint that is secured, but that doesn't require any scopes. The last option will be a button that issues requests to the endpoint that is both secured and that requires a scope (in this case, read:messages). Clicking on any of these buttons will issue requests to your Spring Boot API and will output the result on the screen. "I just learned how to secure Spring Boot APIs and SPAs with OAuth 2.0." Again, you can find the accompanying repository and code developed throughout this article in this GitHub repository. If you have comments or questions, don't hesitate to reach out to us through the comments area down there. I hope you enjoyed.